From May - August, five seniors from Palestine lived on campus and became part of the College community as active participants in the Summer Research Program at Manhattan. A few days before leaving Manhattan College, where he had spent the summer conducting complex genetics research with assistant biochemistry professor Bryan Wilkins, Ph.D., Bethlehem University student Ali Zawahrah paused to recount all he had learned during his visit. The Palestinian student – who was one of five from the West Bank this year to participate in the Bethlehem University-Manhattan College Summer Research Program – absorbed quite a lot academically from Wilkins throughout the course of their study, which examined the functionality of cells in the body that store DNA and other genetic information. Moreover though, Zawahrah said it was the interpersonal skills he learned from his faculty adviser that were the most valuable. “[Wilkins] taught me how to manage my time, how to meet and introduce myself in a professional way, and how to make a good first impression,” said Zawahrah, who is is still in the process of becoming fluent in English. He is also a chemistry major, and as such, needed to brush up on certain biology concepts he was unfamiliar with. For overcoming these obstacles, Wilkins praised Zawahrah. “[Ali] came here to work on a very biologically heavy project with essentially no biology background, and made every possible effort to familiarize himself with the topics he needed to understand. 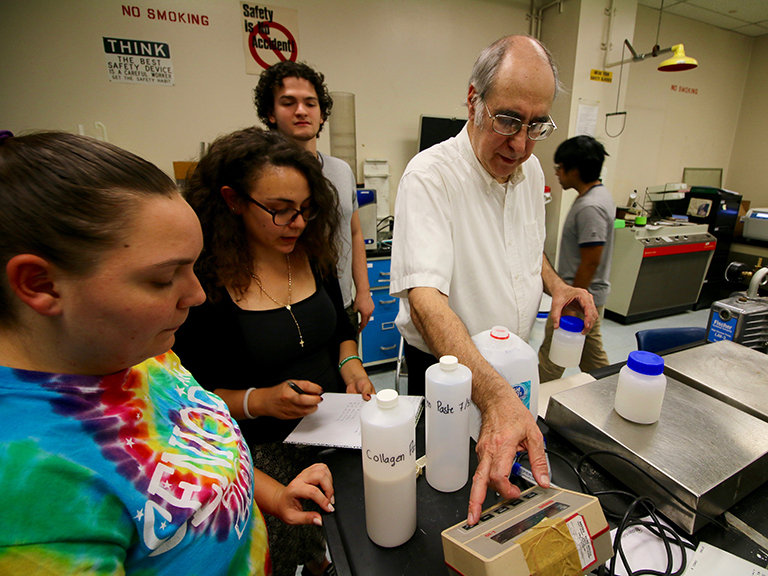 He had an innate desire to learn, and went far above the expectations of any student coming to do summer research,” Wilkins says. 2017 was the second year that the College’s Summer Research program included Bethlehem University students. Last year, there were only two, but this year there were five: Zawahrah, Jane Alawi, Ghassan Harami, Jackline Khoury and Randa Al-Obayyat, who each worked under the guidance of professors and in collaboration with students of the College. Bethlehem’s participation in Manhattan’s summer research is part of an ongoing Lasallian partnership that strengthened in January of 2017, when six faculty and two staff members from the College traveled to Palestine to immerse themselves in the culture and history of the university and the holy city it’s named for. While in the West Bank, Aileen Lowry Farrelly, CPA, visiting professor of accounting, and Gennaro Maffia, Ph.D., professor of chemical engineering, met with faculty in their academic disciplines to discuss summer research initiatives for which they planned to recruit Bethlehem students. A few months later, their ideas became a reality. 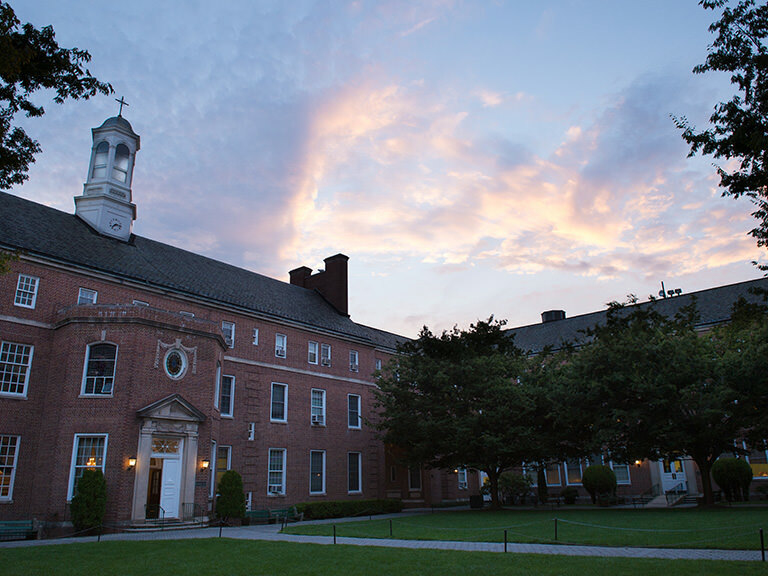 The Bethlehem University students' summer at Manhattan College was captured recently in a video segment by News 12 The Bronx. Watch it here. During their stay on campus, the Bethlehem visitors explored New York City for academic, as well as cultural, purposes. For instance, in her research, Khoury incorporated demographics of the Bronx (i.e. population size, education, and average economic and income levels) to assess financial literacy among its residents, and compare it with those of the West Bank. She administered the comparative study under the guidance of Farrelly and Amira Annabi, Ph.D., assistant professor of economics and finance, and alongside Alyssa Reeser ’18, with whom she became close throughout the summer. “I am thankful for the partnership between Manhattan College and Bethlehem University, as it offered me valuable time to do such research. Not only did I have a great experience with the College faculty, but I was also able to build a lifelong friendship. Alyssa was the best research partner, yet a better friend!” says Khoury, who is studying accounting and business at Bethlehem. She also found a resource in Farrelly, who accompanied her on interviews with Ariva and UNHP, two nearby non-government organizations (NGO) that connect low-income New York City residents with the resources to make informed financial choices. Their immediate goal was to compile statistics from the Bronx and the insight they gleaned from executives and volunteers at the NGOs to launch a pilot program that helps students at Bethlehem manage their student loans, and develop strategies for banking, budgeting, and saving money. When Khoury and the rest of her cohort weren’t in the library or lab, they were taking in the sights of New York City and capturing it all on camera. On separate occasions, the students visited the Metropolitan Museum of Art, Coney Island and walked the High Line and the Brooklyn Bridge. The group also caught a live performance of their favorite Lebanese music group, Mashrou’ Leila, in Brooklyn, and heard jazz with Natalia Boliari, Ph.D., assistant professor of economics and finance, who led an excursion to a music venue near Columbus Circle. Farrelly was also significant in welcoming the Bethlehem students. She facilitated separate outings to Six Flags Great Adventure and Bushkill Falls in Pennsylvania, and to the beach. 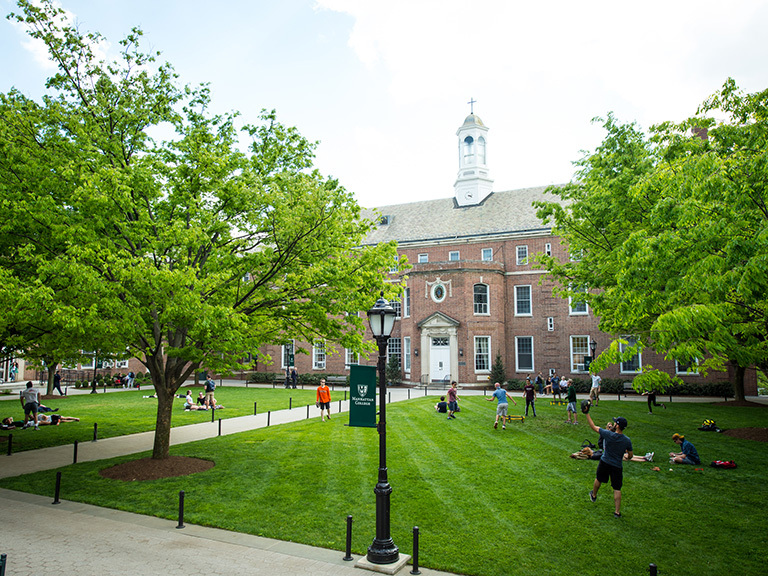 While at the College, the Bethlehem students developed a close rapport with each other, the professors and students they worked with, and with the wider College community. This was especially valuable during Ramadan, when Mehnaz Afridi, Ph.D., associate professor of religious studies and director of the Holocaust, Genocide, and Interfaith Center at Manhattan, hosted the students for iftar, the religious gathering that commemorates the breaking of the fast on each day of the holy month. At her home, Afridi cooked traditional Middle Eastern dishes like fish biryani, halwa, chickpeas and baba ganoush. She also helped Al-Obayyat navigate where to find halal food nearby, as non-halal (food that is non-permissible under Muslim law) is prohibited during Ramadan. According to Afridi, observing Ramadan with the Bethlehem students was enriching for all involved. When it came to differences in educational customs between the West Bank and U.S., some variations in practice served to benefit the Bethlehem students. For Alawi, the research she conducted with Gennaro Maffia Ph.D., professor of chemical engineering, and senior Amanda Peterman ’18, was the first she’d ever completed with another student. Given the particular project she worked on with Maffia and Peterman, those elements are crucial – transforming the animal product waste bovine corium into tissue involved many processes: milling, freezing, thermal soaking, freeze-drying and crosslinking of collagen dispersions, to name a few. Eventually, their creation could serve as a remedy for arthritis and as a means of solving other biomedical issues. The paper Alawi and her team drafted on their research findings has since been accepted for publishing in the International Journal of Engineering Research and Technology. To help Bethlehem student Harami understand the intricate web programming language, Python, Musa Jafar, Ph.D., associate professor of computer information systems, extracted content from Pope Francis’ Twitter page to illustrate how to view the engagement various posts receive (how many likes, retweets, etc.). He used this type of data, and many others, to exemplify what would be needed to lay the groundwork for developing a web-based social media analytics platform. This was the focus of the research he conducted with Harami, a computer information systems major at Bethlehem, and Shintaro Nakamura ’18, a senior at the College. Meanwhile, Al-Obayyat and faculty adviser Ahmed Hussein, Ph.D., an electrical and computer engineering professor at Manhattan, were exploring the information technology sector as well. Their objective was to enhance network connectivity or, as Al-Obayyat simply said, “make the internet faster.” By working to increase the capabilities of high bandwidth networks, mobile network service providers may improve the internet speed of their mobile devices, they cited as their hypothesis. As summer came to a close, the abundance of academic growth the Bethlehem students gleaned from their collaborations with College faculty, staff and students was only matched by the variety of experiences they had in New York. Unfortunately, they will not be able to present findings of their research with their Manhattan counterparts at Research Scholars Presentation Day on September 29, but they will issue presentations to fellow students and faculty at the beginning of their fall semester at Bethlehem. So what’s on tap for next summer? According to Cory Blad, Ph.D., associate professor of sociology who co-directs the Summer Research Program with Rani Roy, Ph.D., assistant vice president for student and faculty development, the College hopes to expand research connections so that more College students and faculty are involved, and explore other areas of partnership with Bethlehem University.